Vibhuti gets drinks for him and daddy, Daddy asks why are we at this hour, and why are you so happy, Vibhu says im happy because i brought happiness and peace to Angoori bhabhi i satisfied her, daddy asks what do you mean, vibhu says i always thought sbe has hidden dancer in her and made her dance on my drum tunes, daddy gets angry, and slaps him. Vibhu asks why slap,i didn’t tease her, daddy says you did worst then that,i feel like killing you, tiwari joins them and says go ahead im her husband she should dance on my tunes, Vibhu says not my fault you can’t play drum,daddy slaps tiwari too, daddy says did you forget Tiwari i had warned you not to do so, tiwari says i don’t remember clearly, daddy says she losses control when she hears those tunes, Vibhu says because she is a born dancer,i cant explain how good she is,daddy slaps him. Daddy narrates them a story, Angoori had problem with this tune since she was a kid, mastram found about it and decided to take advantage of this situation,he use to keep Playing and Angoori kept dancing and believed Angoori would be his, and a day came when he hurted his fingers and he couldn’t play and since then Angoori was behind him to play drum,and beat him till he played, he left the tone scared of Angoori. Angoori sees Anu in balcony and asks how is she doing, anu says bored sitting home, angoori says few more days and you will be good, you will even dance,rest now bye and leaves thinking where is vibhu. Boys walking around, anu calls them and asks did they see Vibhu,both say no he is any way jobless must be roaming some where. Saxena gets tiwari home, and says im waiting for you and you were enjoying yourself, Tiwari says i was talking to my father in law, Saxena says you committed me a month for drum classes, Tiwari says i give up on commitment, Saxena says you can but i won’t,so you won’t get rid of me,you have to attend thos class, Tiwari says i don’t need i wont,saxena takes off his belt, and says pick the drum,or else you will have to face the consequences and hits him, tiwari starts practising. Angoori in garden,vibhu hides, a guy passing by asks vibhu why hiding, and gives him advices thinking he is unwell, Angoori asks Vibhu whats wrong, vibhu says hello, Angoori says play drum, Vibhu says I cant my fingers are paining, angoori purposely presses them and says they are fine play it cmon, i will get you drum here play it, vibhu plays it scared of angoori, Angoori starts dancing, Tiwari hears and rushes to them, and stops vibhu. Angoori shouts play cmon, and starts laughing. Vibhu and Tiwari leave scared. Boys discuss about hiw difficult is police training, Tilu says i just hope Hapu appoints us, Hapu walks to them,Hapu says you are right your training officer has arrived, teeka says some training,,hapu says so what will you do tell me your to do,teeka says clean the toilets,tilu says bathe your kids mother i mean your kids, Hapu asks what nonsense,tilu says sorry slip of tounge, Malkan says i will massage yoy,Hapu says good you are in right track now party tonight. pre cap: Angoori scares Vibhu and asks him to play drum. Angoori locked , and begs to play drum, Saxena forces tiwari to play and he does. 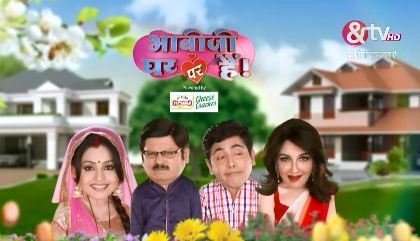 The post Bhabhi Ji Ghar Par Hai 7th March 2019 Written Episode Update Angooris madness appeared first on Telly Updates.